realising your outcomes (i.e. ensuring you are putting energy and effort into the things that are highest value to you). The structure of the system (and the book) is logical and easy to follow. It is written clearly and offers practical tips. I especially appreciated the emphasis on keeping things simple. A simple system or process is easier to follow and maintain. I’ve tried following David Allen’s ‘Getting Things Done’ system, and found it too much effort to maintain. On the other hand, Dermot’s approach strikes the right balance of practicality and relatively low effort with ensuring that you’ve got all your task inputs and actions captured and under control. While I already have a reasonable solid, effective system in place for my personal planning and productivity, I’m constantly looking for minor improvements. I was able to skim Dermot’s book and find a number of useful tweaks, especially in the ‘tech tips’ section at the end of each chapter. One improvement that I’ve implemented is to organise my task list by start date. I use 2Do as my electronic task management tool. The default order for task display is due date. I was using this default and got out of the habit of entering a start date for each task. In order to figure out what to work on each day I needed to scan through all tasks due in the coming 1-2 weeks, mentally constructing a Gantt chart in my head. I would use priority flags to identify the tasks I wanted to work on every day. The flags would be used for a secondary sort of task display order. Obviously this process had more steps, effort and time for daily task management than was necessary. Based on Dermot’s tip I assigned a start date to all open tasks (as well as due date) and I now display tasks in start date order. It’s much simpler and quicker for me to identify what to work on each day. Consistent with my goal of a short daily dispatch I’m leaving this post with one key tip today. I’m sure more productivity posts will appear in dispatches. 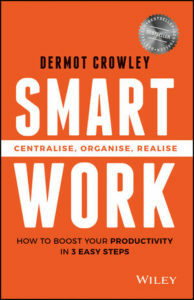 If your current approach to managing the flood of incoming tasks, emails, messages and meetings isn’t working well for you, I recommend you read and apply Dermot’s book. This entry was posted on January 8, 2018, 8:19 am and is filed under Productivity. You can follow any responses to this entry through RSS 2.0. You can leave a response, or trackback from your own site.